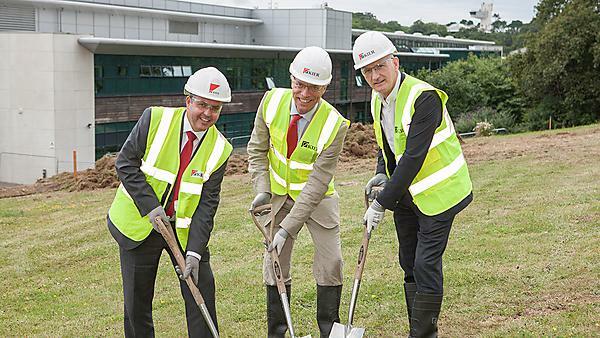 Work has begun on an innovative £14 million facility which will house life-changing health and medical research. The Derriford Research Facility at Plymouth University will be home to biomedical research currently based on the University’s main campus in the city centre. Research projects range from the diagnosis of Down’s syndrome to antibiotic resistance, the use of viral vectors as a way to disseminate vaccines for Ebola and bovine TB, the role of ancient DNA in modern health, genetic influences on post-natal depression, and others. It is being built adjacent to existing laboratories at Plymouth University Peninsula Schools of Medicine and Dentistry at Plymouth Science Park. Its close proximity to these laboratories, where scientists investigate a number of conditions including brain tumours, neurological disorders such as Azheimer’s and Parkinson’s diseases, cancer, stroke and hepatitis, will mean closer collaboration between lab-based medical researchers at the University. Its position will also enable greater interplay between University researchers and research clinicians at Plymouth Hospitals NHS Trust. Health and medical research at Plymouth is supported by a variety of funding sources, from the National Institute for Health Research to the Medical Research Council, the Wellcome Trust and other major institutional funders. Support also comes from major UK health charities – Plymouth is one of four Research Centres of Excellence adopted by charity Brain Tumour Research and it is a lead research institution in the Alzheimer’s Research UK South West Network. The University is also working with local and regional charities, including Peninsula Medical Foundation, which is fundraising for medical equipment for the new building. To find out more about supporting medical and health research at Plymouth University, please visit our Campaign Pages.